I've been working on an idea for a new pattern for a few months now. Back in the Spring, I knit a custom toy for an acquaintance, and I loved the finished toy so much that I knew I had to publish the pattern. You can see this toy in the photo below: a Scraps Chaps style elephant! 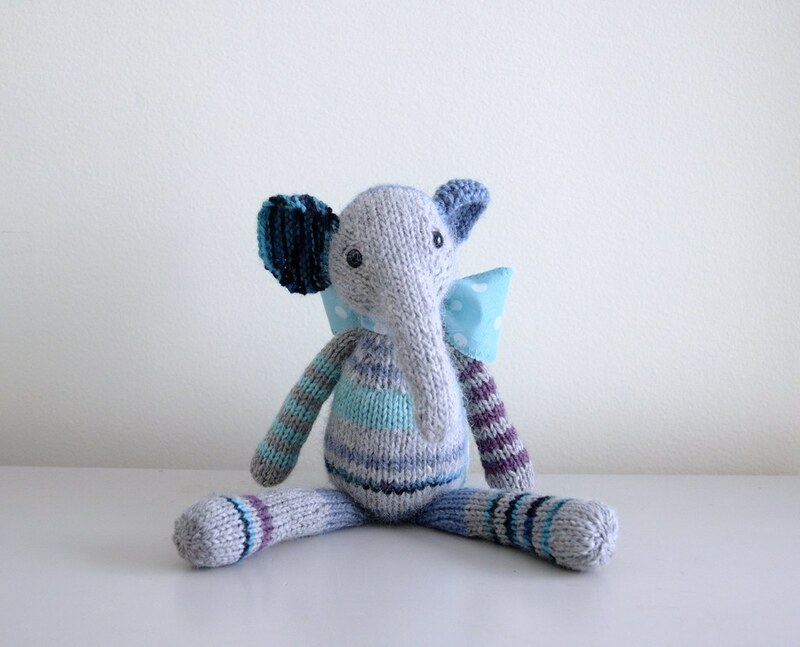 People had been asking me for a long time to design an elephant, but there are so many elephant patterns out there, it took me a while to come up with an idea for one that would be all Fuzzy Mitten style. However, while I love the scrappy look of that elephant, I thought I would try something a little different for the actual pattern. My original inspiration for the Scraps Chaps was Noro yarn, with it's interesting texture and beautiful long colour changes. However, that yarn always seemed too pricey to use for a toy, so I came up with the alternative of using yarn scraps. But now there are several other companies with similar yarns at a more affordable price, specifically Knit Picks Chroma yarn. So, I ordered myself a ball, in the Midwinter colourway, which seemed perfect for an elephant. Sneaking in bits of knitting time here and there (this is a real challenge with a toddler and baby in the house), I've finally managed to knit up all the pieces. They're just waiting for a larger chunk of time for me to put the toy together. So now I need to decide if that is all the pattern will include, i.e. an elephant knit in your choice of worsted weight yarn. Or, if I want to include something else with the toy. Usually my patterns come with a clothing outfit, and since the Scraps Chaps don't fit my other clothing patterns, this would be a good choice. But I have too many ideas, and I'm just not sure what you'd like! I've drawn sketches for a raglan cardigan, a shawl-collar coat, a shrug, and a shawl. But I'm open to other suggestions. On the other hand, I have a couple other ideas floating around. Maybe I should write it up with more sizes, with the original Scraps Chaps style being medium (about 12" tall), plus larger and smaller sizes knit with thicker and thinner yarns. Or perhaps I should include other animals in the pattern, like how the Scraps Chaps comes with instructions for a rabbit, dog, and lion. Since this is all rather a bit complicated to put in a poll, I'll just let you leave a comment with the option you'd like best. Now, of course I won't be able to please everyone, since I'm just looking for one good idea to include with the elephant pattern. Perhaps the weight of opinion will point me to the most popular choice, or perhaps I'll come up with something all on my own (that's happened before - but I do value your input anyway). Anyway, I will let you know when I've decided, and if all goes well, the pattern should be ready by the end of the summer!